Alan Peroutka, Geraldine Moreno Black and Ed Black view Ritz Story Pole. The Ritz Story Pole is a community art project taking place at The Oregon Country Fair with funding through Indiegogo. As of this writing, $16,965 (37%) has been raised of the $46,000 goal with only 16 days remaining. Your donation of any size will help complete, engineer and stand this monumental work of art which is a testimonial to vision, planning, cooperation, and determination. For three years carvers, painters, metal workers, amateurs and professionals have been working on this one-of-a-kind, 36 ft. Story Pole designed for the 21st century. Inspired by Northwest Coastal art, there are 21 totemic characters represented on an 8,000 lb. Alaskan Yellow Cedar log that was sustainably harvested with the approval of First Nations and the Canadian Provincial Government of British Columbia. My connection to this project is through my friend Ed Black who's been involved with the Ritz Sauna and Showers and the Oregon Country Fair for about fifteen years. The concept of crowd funding for community projects fascinates me. 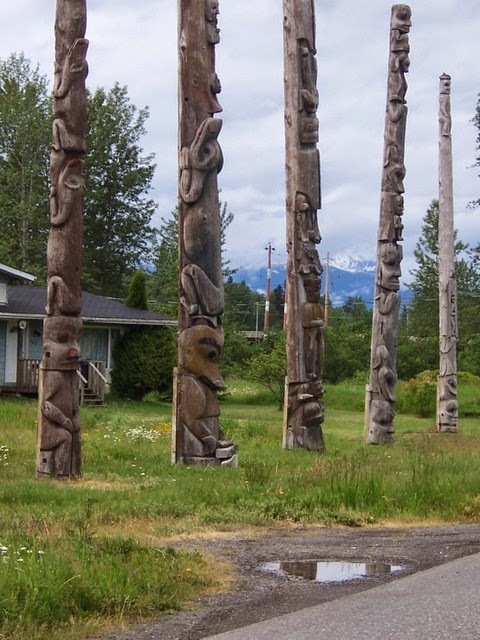 As a life-long resident of the Pacific Northwest, I've been interested in Native American art for many years and gained a special appreciation for it during a trip to Alaska in 2008. Since then I've become familiar with Canadian artist Emily Carr, whom I've written about previously. 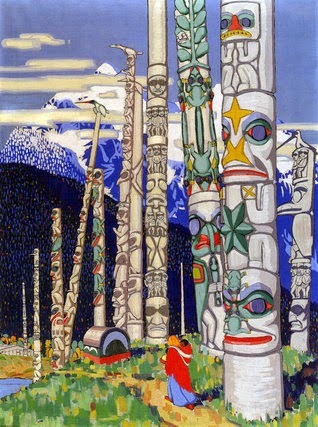 I think her 1924 painting "Gitwinkool Totem Poles" is spectacular. Totems seen in Alaska (can't remember where!) in 2008.